Perryhan El-Ashmawi works with a post-modern approach by placing her subjects within an intensely coloured and ornamented surface. She merges pop culture with a rather traditional painting technique, creating an ‘eye-candy’ that is aesthetically pleasing to the viewer. By doing so, Perryhan’s artwork plays on society’s insatiable need to impress the public with pleasing depictions. Perryhan works with large-scale dimensions mainly treated with oil paint, but are often interrogated with spray paint and stenciling techniques. Graphic and graffiti illustrative work are a few examples of urban art that has influence in her artistic style. Perryhan El Ashmawi was born in Bahrain in 1988 to Egyptian parents. In 2009 she attained a BA in Fine Art from Concordia University, Montreal, Canada, majoring in Painting and Drawing. She has held exhibitions in Bahrain, UAE and Canada. 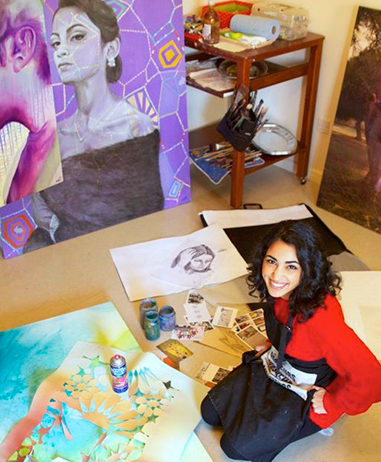 She was also fortunate to showcase for the 39th Bahrain Annual Fine Arts Exhibition. Perryhan is a member of The Tashkeel Arts Group and Bahrain’s Art Society, where she participates in various artist-led workshops. Whether or not Perryhan’s artistry rises to an international level of stardom as she envisions, she is certain that art will always be a lifetime passion. This Autumn Capsule Arts will launch a set of limited edition art prints by Perryhan El-Ashmawi that will be available to purchase at capsulearts.com, for more details about her featured artworks and the launch collection sign up here.